NMMA President Thom Dammrich accepts award from MRAA President Matt Gruhn. 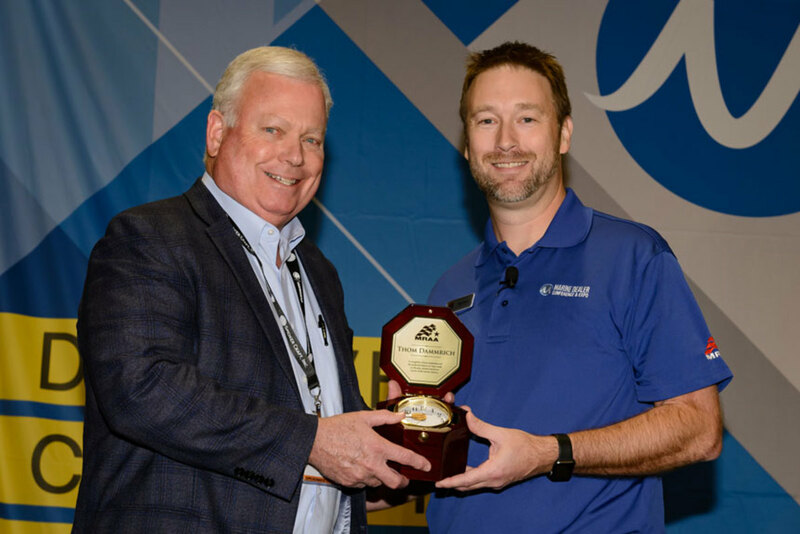 At a luncheon yesterday during the Marine Dealer Conference and Expo, Matt Gruhn, president of the Marine Retailers Association of the Americas, presented awards to several executives retiring from the industry, as well as noting additions to its online curriculum. Gruhn also spoke about MRAA’s education mission to the 800 boat dealers and other industry personnel at the luncheon. He said MRAA has more than 100 online courses on leadership, sales, service and marketing. New courses on customer relationship marketing, customer experience, workforce development and aligning with customers will be added to the curriculum. Gruhn also recognized Paul Norman of Norman-Spencer Insurance for his contributions to the dealer association. Norman is a founding member of the MRAA, whose business focused on the dealer network. He recently sold his business to Global Marine Insurance. Gruhn also identified four recipients who attended MDCE on scholarships provided by Soundings Trade Only magazine: Brandon Mick of Indian Lake Marina in Pennsylvania; Laura Ponder of Captain’s Marine in Montana; Chris Hibbard of American Marine in Wisconsin; and Frank Ferrer of Nautical Marine in Florida. Gruhn presented NMMA president Thom Dammrich with a gift and special recognition. He spoke about how Dammrich had become a “mentor” over the years and referred to the NMMA as “our friends” several times. He noted how Dammrich was instrumental in creating a better working relationship between manufacturers and dealers. “The industry will miss him,” Gruhn said, referring to Dammrich’s retirement in 2019. In accepting the gift, Dammrich said it was unlikely that he would’ve heard any MRAA officers refer to NMMA as “our friends” 19 years ago when he took over as president of the association. 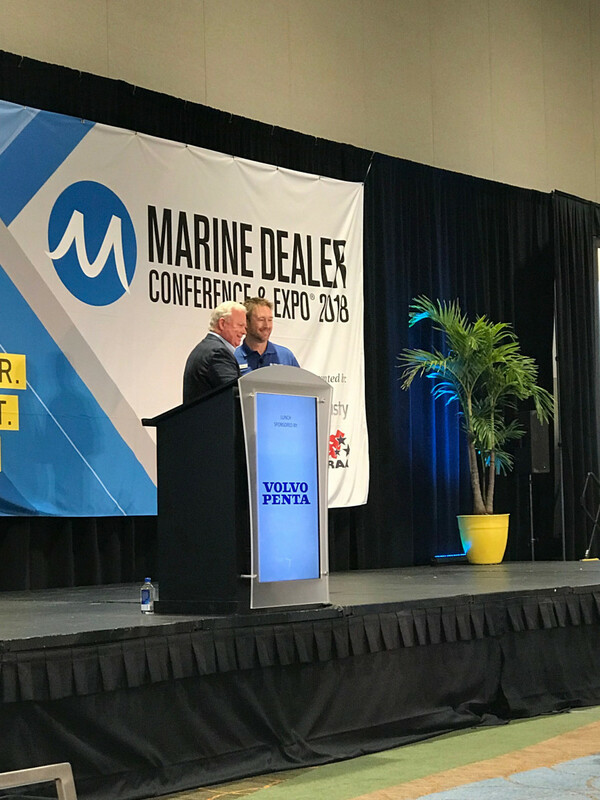 “Today we’ve seen a dramatic change in the relationship between dealers and manufacturers, and I consider many dealers my friends,” Dammrich said, adding that his first dealer friend was Larry Russo of Russo Marine (now MarineMax Russo). Dammrich, who received a standing ovation, retires in September 2019.